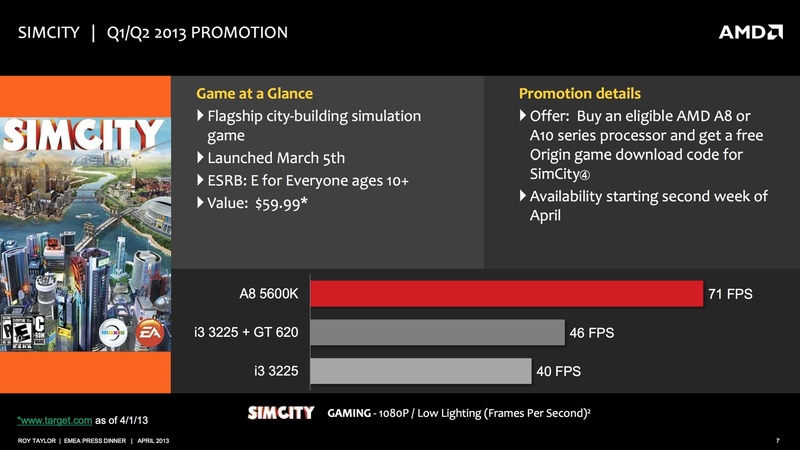 Starting from April 18th, AMD would bundle their A-Series APUs with SimCity which was released by Maxis last month. Only a select amount of AMD A-Series APUs would get the new promotion which include both Trinity and the upcoming Richland A-Series. AMD currently offers a wide range of gaming titles with their Radeon 7000 series graphic cards which fall under their “Never Settle” and “Never Settle Reloaded” promotions. EA also announced during the Battlefield 4 unveil that AMD would from this day onward would be their Hardware partner, the game was demonstrated on the un-released Radeon HD 7990 GPU. AMD is also planning to refresh their Never Settle bundle in the upcoming months with new games such as Battlefield 4, Watch Dogs and a unreleased PC game as mentioned by Fudzilla. With the GPU section covered, AMD now plans to offer gaming bundle promotions with their current and upcoming line of A-Series APUs. As a head start, AMD would be offering SimCity with a select number of A-Series APUs which include A10-5800K, A8-5600K. The promotion would be expanded to Richland A-Series APUs (A10/ A8) when they launch on 18th-19th April 2013. Considering the price of the game which falls at $59.99, that’s quiet a value you get with AMD’s A-Series APUs and a game that is much loved by almost everyone aside the fact that its launch was quiet underwhelming but hopefully with the server issues fixed, anyone can play it with ease now. On purchase of an AMD A10 or A8 series APUs, users would get a key code for the game which would be redeemable via EA’s Origin service that can be downloaded from here. On average, a single AMD A8-5600K APU delivers 71 FPS compared to an Ivy Bridge setup (i3 3225 + GT 620) that gives 46 FPS in SimCity at 1080P res. The i3 3225 alone can only provide 40 FPS with its HD 4000 iGPU. 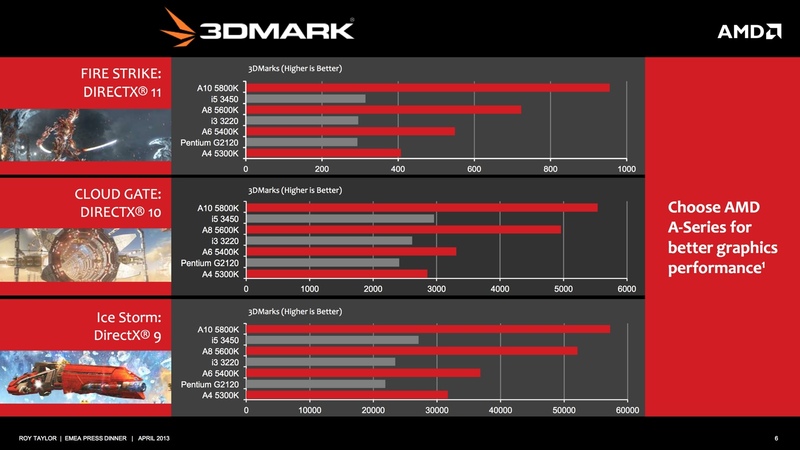 There are further charts which show AMD’s dominance over Intel’s Ivy Bridge CPUs in 3D Mark 11. 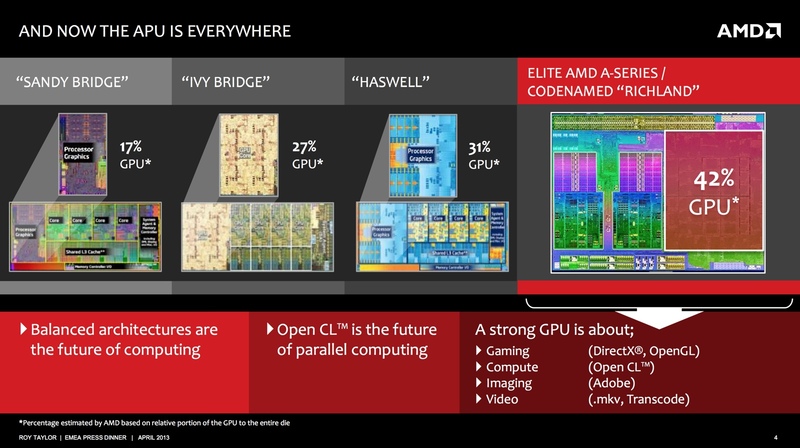 The last slide is the most interesting to note, with AMD showcasing the Richland APU delivering 42% GPU performance compared to 31% GPU performance of Haswell and 27% GPU performance of Ivy Bridge. The performance gains are quiet notable and only a day earlier we reported the first benchmarks of Richland A-Series GPU which were 80% faster than Ivy Bridge HD 4000 GPU. You can learn more about AMD’s A-Series APUs and the Richland lineup here.